The camera watches the sheep. The sheep stare back. And stare. And stare. And stare. That’s the design of two shots that come along early in Sweetgrass. And even though there aren’t many shots quite like those in this unfortunately hard to find documentary, those compositions are surprisingly indicative of the film as a whole. Sweetgrass is an observant picture made up of noticeably lengthy shots that often redefine themselves as they unfold. In those previous examples, the initial humor of looking into the eyes of dumb-fascinated sheep eventually gives way to an unanticipated reverence for nature’s beauty, which then gives way to a feeling of unremarkable indifference. These are contradictory reactions, but within Sweetgrass they prove to be warmly compatible. If the blank expressions of the glassy-eyed grass-chomping sheep make you giggle, you get this film’s charm. If at the same time the sheep somehow touch you with their awkward elegance, you’re still right. Filmmakers Ilisa Barbash and Lucien Castaing-Taylor have crafted a picture that is at once gritty, poetic and procedural. That’s what’s neat about it. There’s also this: Whereas so many documentaries feel like long-form journalism (not that there’s anything wrong with that), Sweetgrass is cinema. It’s without omniscient narration, talking-head interviews or any other cues that might help explain what’s going on. It’s an experience, not a lecture. It’s something to feel, not something to learn. 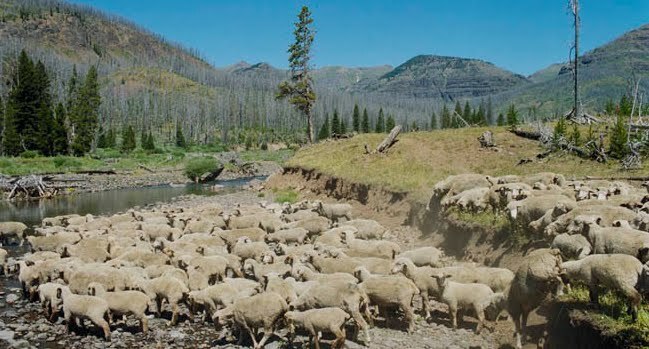 Sweetgrass shows – not tells – the experience of two cowboys taking their sheep through public land in Montana to fatten up on mountain grass. We watch this unfold with the knowledge that this all occurs in the Absaroka Beartooth range in the not-so-distant past, but that’s the extent of the film’s clearly defined context. Other details, such as the number of years that cowboys (er, shepherds) have been doing this sort of thing, and the number of weeks that a sheep-drive takes, aren’t provided until the closing credits, which is why I won’t provide that context now. The filmmakers’ choice not to chart the passing of time was in part a casualty of their approach, compiling their footage over several years and mashing it up into one narrative arc. Nevertheless, the decision to plop us into the middle of this wilderness adventure with scant explanation is a clearly conscious one. We’re not meant to know. We’re expected to discover. Sweetgrass isn’t esoteric so much as it’s nebulous. Of course, given all that goes unexplained, Sweetgrass can be a challenge to endure, even for the most patient of viewers. It must take 30 minutes for the film to deliver as many cuts as we experience in a routine television commercial break. The documentary’s pace is languid and the cowboys’ routine is somewhat monotonous. All by design. Sweetgrass yanks us off the information super-highway and plunks us into the middle of nowhere. For a culture that keeps smart phones at the ready for any 140-character-length lulls in the action, Sweetgrass – both the film itself and the happenings it observes – is like detox for our stimuli addictions. It can be uncomfortable at times, but ultimately it’s invigorating, purifying, as if we’ve spent the movie’s 100-minute running time inhaling that fresh Montana air. Eventually we realize that it’s fitting that the film is made up of languorous long takes in which, for the most part, nothing too remarkable occurs, because those shots reflect the sheep drive itself. John and Pat, the two cowboys with whom we spend the most time, move with the nonchalance of guys who appreciate the difficulty of their task and are careful not to expend energy unnecessarily. At one point, the elder John takes a good five minutes just to saddle and mount his horse, which is probably the equivalent of you or me taking as much time to back a car out of the driveway. But there’s no point in rushing. To move quickly would be to risk moseying past an arrowhead lying nestled in the grass, the discovery of which is cause for lengthy celebration. For the most part, Sweetgrass is as slow and steady as you’d expect a documentary featuring livestock to be. But it’s exhilarating, too. There are encounters with bears, which prompt John and Pat to spring into action and fire their rifles into the darkness around them. And at least twice the filmmakers induce goose bumps with some outstanding cinematography – in one case zooming out from the sight of Pat cussing the sheep to take in the enormity of the panorama, in the other case zooming in to reveal that the distant ribbon of white isn’t rock or snow but sheep descending the mountain en masse. The only downside of these striking compositions is that they’re recorded in a rather muddy digital video that seems all the more indistinct in the aftermath of recent HD epics like the Planet Earth series. But if we can overcome our growing penchant for Blu-ray-esque perfection, we’ll see that Sweetgrass is still visually lush, in addition to being surprisingly touching. By the time John and Pat bring in their herd, we feel their joy as if it’s our own. John and Pat have fought through exhaustion and fought off bears. They’ve survived weeks in a breathtaking world doing breath-catching work. Surprisingly enough, after all that time spent outdoors with only one another and the animals for company, what these guys seem to covet most is a little peace and quiet.